New one pound coins calls for buying new trolley coins/trolley tokens! Mark the date! Royal Mint is producing 1.5 billions of the new UK £1 coin from March 2017. This is said to be the most secure coin in the world. 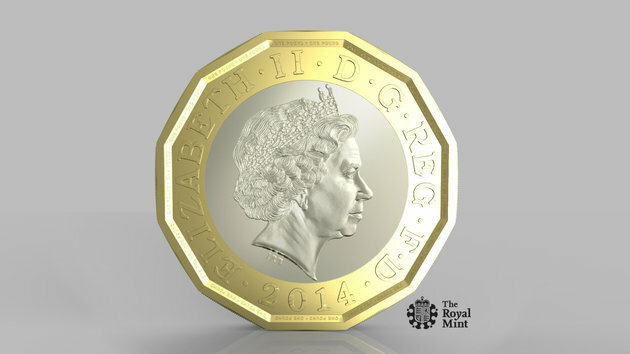 The existing £1 coin will begin to be withdrawn from circulation. Approximately one is 30 £1 coins in circulation is counterfeit. For the first time in over 30 years, these coins are being replaced to avoid counterfeiters. New design shows the English rose, the Welsh leek, the Scottish thistle and the Northern Irish shamrock emerging from one stem within a royal coronet – created by David Pearce, winner of public design competition at the age of 15. It is 12-sided! its unique shape makes it instantly identifiable, even by touch. It is made of two metals. The outer ring is gold coloured (nickel-brass) and the inner ring is silver coloured (nickel-plated alloy). Latent image – it has a hologram that changes from a ‘£’ symbol to the number ‘1’ when the coin is seen from different angles. The existing £1 coins will stop being legal tender on October 15, 2017. Is your business ready for this change? This is the best time to order your custom trolley coins, also known as trolley tokens or trolley keychains. Order your New Trolley Coins/Trolley Tokens/Trolley Key chains now! Trolley tokens have been a huge success in the recent years. Unlike other promotional items trolley coins have a fantastic range of daily uses as you can use trolley key chains at supermarkets, gym lockers and for luggage trolleys at the airport. You can personalise both sides of the trolley coins, with your logo, include your telephone number and website on the back of the trolley coins. A custom trolley coin is a constant reminder of the brand and if the design is brilliant, it acts as a piece of fashion wear! How are the Supermarkets and Vending Machines Coping? Tesco, one of the biggest supermarket have planned a transition period of just over six months when the old circular pound trolley coins will be still accepted as legal tender. Sainsbury’s, Morrisons, Lidl and Waitrose are also embracing this change. Currently, their trolleys accept both old and new coins. The Automatic Vending Association (AVA) estimated that there around half a million vending machines across the UK and that all vending machines will be fully upgraded by October 15. Are you looking for personalised Trolley Coins/Trolley Tokens/Trolley keychains to promote your business? We can help you! We work with Schools & Universities, Charities & Fundraising, Corporate, Clubs, Associations, Public Sector, Consumer Brands and Agencies to create bespoke trolley coins/trolley tokens designed for your needs and branding.